The Rinnai Tankless Water Heater Reviews offers potential customers first-hand accounts from previous users. We love them because they provide constant hot water for up to five plumbing systems all at the same temperature. Some of the popular models which we will touch on below boast an 83 % efficiency and feature a 9.4-gallon generating capacity of heated water in a minute. Because of this, the appliances offer substantial power and area savings. They also provide a sleek, contemporary style with a staged cover. 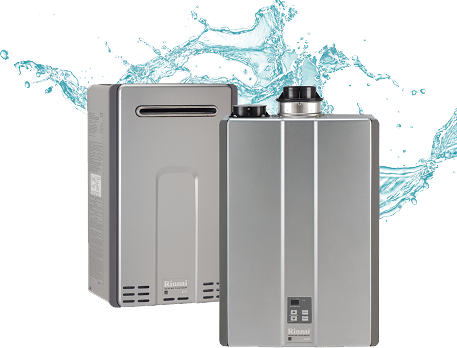 These are among the most common qualities that you can find in our Rinnai tankless water heater reviews. Like all models of tankless heaters, the Rinnai are energy-efficient, space-saving and incredibly easy to install. Many of the Rinnai tankless water heaters are easy to install, especially for those who are used to doing home maintenance themselves. These appliances tend to be more costly to install if you’re hiring a professional. However, if you’re unsure of how to do it yourself, it would be best to consult an expert. Well tankless water heater are generally energy-saving, those that use gas as a power-source are even more so. By using a gas water heating system, such as the Rinnai RL94eN Tankless Natural Gas Water Heater, you will be sparing yourself unnecessary energy bills. As you know, appliances like the Rinnai water heater that are energy-saving, save you money too. Using the Rinnai RL94eN as an example, you will notice the touch-pad and digital temperature display. This makes it possible for you to set your preferred temperature easily. So there is no need to worry about burning yourself or the little ones with water that is too hot. Simply set the temperature as required. This model also comes equipped with an indicator which tells you when you need to flush the water heater. By backflushing when the appliance indicates that it needs it, you ensure that the heating system will work optimally and remain durable. One of the main reasons why people switch to tankless water heaters is because you can get hot water on demand. There’s no need to wait for the water tank to fill. Simply switch on the tap and the heating system will do the rest. Rinnai is no different in this aspect. You will never have to worry about running out of hot water. The Rinnai water heater comes with a commercial-grade type of heat exchanger for both residential and industrial applications, as well as includes an MC-91-1US electronic controller along with error code gauge. Both the natural gas and propane models, like the Rinnai RL94iP, are accessible and also the water heater comes in pre-set in 120 degrees F. Virtually all LS units include a newly developed commercial-grade high-temperature exchanger for optimum durability. Hot water heater maintenance is so important to remember and unfortunately, it is something that property owners often neglect to do. Whether you are living in a fairly new or even an older home, it is vital that you examine the heater from time to time to ensure that it is operating correctly. If you’re somewhat handy, this can be done yourself or bring in help to get this done for you. With this, it is best to consult someone or at least read more Rinnai tankless water heater reviews for more related information. Rinnai appliances come with a restricted warranty on both the heat exchanger and the labour and components when registered inside 30 days. Also, the devices qualify for that federal tax credit score. Customers will save what they spend on buying the appliance with reduced future power bills. Rinnai tankless heaters are well known for fantastic reviews. Clients compliment the Rinnai tankless models for their design and that they provide on demand hot water. Customers report that there’s a noticeable distinction in power savings as well. A number of customers provided reviews that most Rinnai models provide a much better ‘minimum stream rate’ than most other water heater brands. While most people only think about a higher ‘maximum stream rate’, when buying a tankless hot water heater, read these reviews below before you make your purchase. Rinnai water heater reviews are the best way to decide which model would be best suited to your household. Customer reviews product potential buyers with useful, first-hand insight. This does not only apply to Rinnai water heaters but any product purchase. Comparison shopping is especially necessary for big buying decisions. You cannot purchase just any water heater. Your choice needs to meet the needs of your household and your budget. Remember to factor installation costs into your budget (unless you’re going to the installation yourself). Tankless water heaters are usually more costly to install, but their long-term benefits outweigh the initial cost. They tend to be lower maintenance and generally need fewer repairs, thus saving you money in the long-run.